Jason Healey is the Director of the Cyber Statecraft Initiative of the Atlantic Council, focusing on international cooperation, competition and conflict in cyberspace, and the editor of the first history of conflict in cyberspace, A Fierce Domain: Cyber Conflict, 1986 to 2012. He has worked cyber issues since the 1990s and is the only person to be both a policy director at the White House and a review board member of the infamous DEF CON global hacker conference. During his time in the White House, he was a director for cyber policy and helped advise the President and coordinate US efforts to secure US cyberspace and critical infrastructure. He has also been executive director at Goldman Sachs in Hong Kong and New York, vice chairman of the FS-ISAC (the information sharing and security organization for the finance sector) and a US Air Force intelligence officer having worked at the Pentagon and National Security Agency. 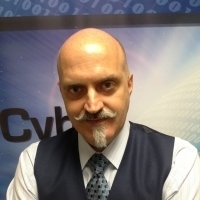 Jason was a founding member (plankholder) of the first cyber command in the world, the Joint Task Force for Computer Network Defense, in 1998. He is a board member of Cyber Conflict Studies Association, lecturer in cyber policy at Georgetown University, lecturer of cyber national security studies at Johns Hopkins School of Advanced International Studies, and author of dozens of published essays and papers.